Members gather at First UMC, Kerrville for Trusted con Confianza training. Churches large and small continue to protect our children by working to ensure their leaders are Trusted con Confianza (trusted with confidence). Following Annual Conference 2017 and the adoption of the new Rio Texas Child, Youth, and Vulnerable Adult safety policy, the Rio Texas Conference Safety Task Force launched Trusted con Confianza – inviting churches and organizations across the connection to participate in this certification ministry. Churches large and small have said “yes” to safe ministry– working on policies and inviting leaders to go through the certification process. Bethany United Methodist Church gathered 165 leaders for their first Trusted training in February. 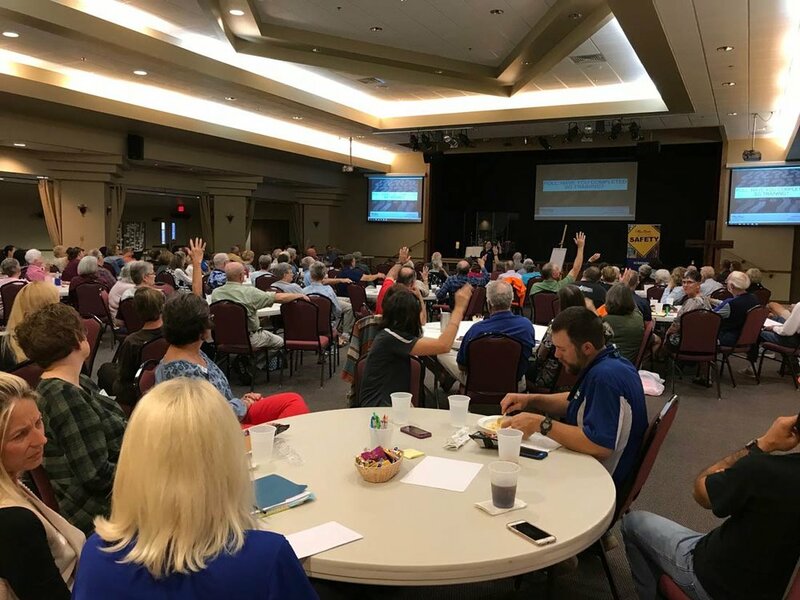 Other large congregations including First United Methodist Church, Kerrville, and Boerne United Methodist Church followed close behind with over 100 leaders at onsite trainings. Smaller congregations are also doing this hard and holy work. Many congregations are either hosting in-person trainings – bringing in a newly trained Trusted con Confianza facilitator – or they are gathering groups at the church or in homes to participate in an online training together. Rev. Everett McCarley, pastor of Medina Valley UMC in Castroville, said that his congregation got started implementing the program immediately. The church scheduled their first training session right away. “We invited the local American Legion Post to come sell Tacos as a community outreach program and hopefully a way to entice more to attend,” he said. That doesn’t mean everyone was on board right away. FUMC, Ganado Rev. Mark Smith described his church’s initial response as “grumbling.” After last year’s annual conference, he decided to make the best of it. Smith said people outside the church have begun to take notice of the changes. Rio Texas Director of Generational Ministries Rev. Dr. Tanya Campen is thankful for the positive response to the program. The Rio Texas Annual Conference is available to help churches begin certifying their staff and volunteers. Informational webinars are available that explain the process and give participants an opportunity to ask questions. Policy webinars focus on guiding ministry leaders as they create, edit, and implement a policy in their communities. 28 facilitators are available to assist you in this work as they lead trainings across the conference.